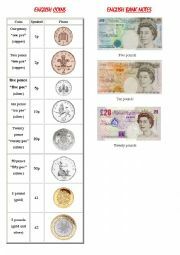 A useful way to teach the English currency, to be followed with practise with actual coins and bank notes, or the worksheet entitled "how much have you got" in my printables. Enjoy! enables your pupils to check their understanding of physical description of people, as well as practising their use of the present continuous for describing simple actions. 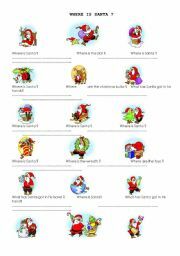 This fun worksheet will allow your pupils to revise the christmas vocabulary, as well as the prepositions of place by answering a series of questions, each one corresponding to a picture where Santa Claus is doing something different. My pupils loved it! 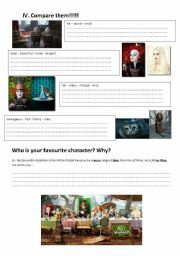 PArt 4 of my 4 pages worksheet which I can�t download on the site (too heavy). 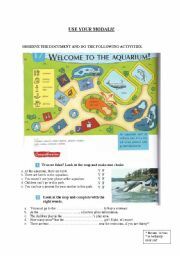 Other parts include amatching exercise (who�s who), a fill in the gap summary, a series of pictures with captions to re-write under the proper scenes. Send a private message if interested, I will sendthe to you through mail. A fill-in the gap summary of Alice, after seeing Burton�s version of ALice in Wonderland. Part of a 4 pages document which, unfortunately, I cannot download on the site. Send a private message for other parts, I will send them through email. 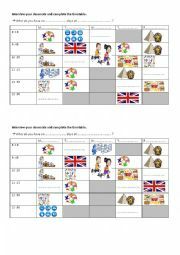 In pairs: student must ask their classmate what subject they have at given time in order to complete the timetable. Describing what people wear as well as fashion styles. 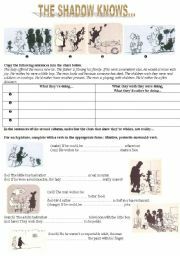 how to express wishes: I wish I were..., I�d rather ..., If..., I would... also download the activity sheet so that your students can express themselves, make suppositions, using those structures. 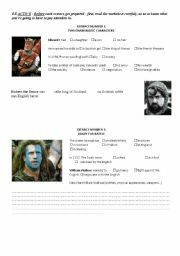 A simple and colourfull document full of fun details which your pupils will be happy to work on. Comprehension skills as well as writing skills and grammar accuracy are demanded. Easy and fun! Where are you from? A brainstorming on English speaking countries and their capitals and flags. Enjoy! Each picture will prompt your students to speak!